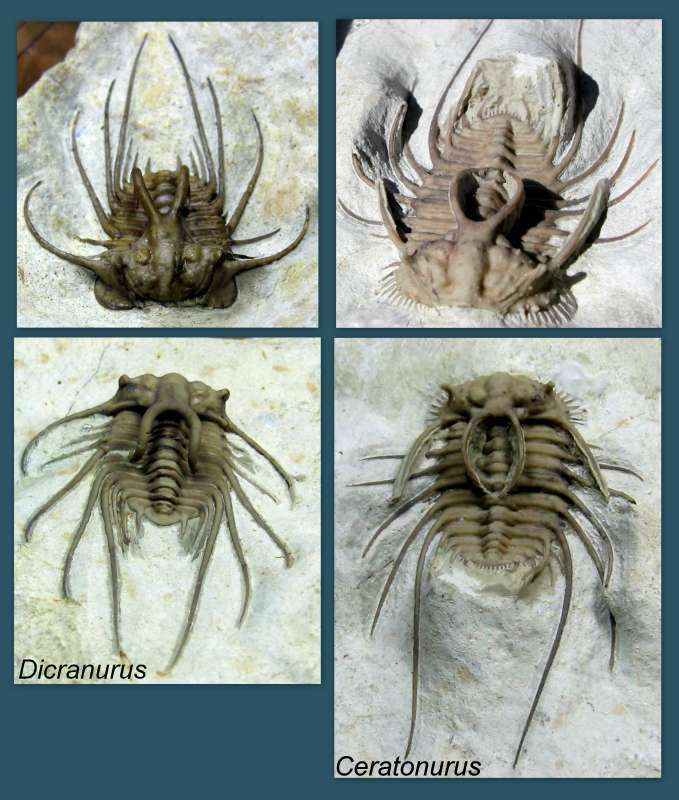 At least four species from four genera of these spiny trilobites have emerged from the rocks of Black Cat Mountain. However, one of these (Kettneraspis) has two forms, based on numbers of thoracic segments, and this distinction needs investigation to determine its taxonomic significance. Furthermore, Ceratonurus species from the Haragan has recently had an analog emerge from the Bois d'Arc; and sufficient differences between these two warrant further investigation to determine their relationship. Mention must also be made of the Koneprusine found last year in Haragan rocks, which was informally assigned to the genus Koneprusia, based on recent investigations of a similar Bois d'Arc species. Kettneraspis williamsi is the most common odontopleurid found at Black Cat Mountain. 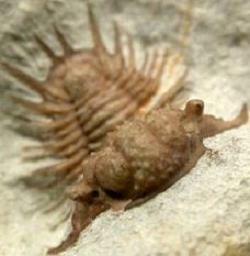 It has occasionally been found in association with other trilobites. Below is an anterior view of this species. Photograph courtesy of Neal Immega and John Moffitt. Here is a collage of Kettneraspis specimens from the collections of Sam Stubbs and John Moffitt showing various aspects and details of the species, photographed by Neal Immega. The darker specimen about half way down the collage on the right, shown associated with a small brachiopod, is unique not only in that it is heavily stained with metal oxide, but it also carries a different number of thoracic segments than is typical. Count its segments and those on the image below it. Below is an un-named species of Kettneraspis from the Bois d'Arc, found and prepared by Leon Theisen. In the image below is a rare association of Acanthopyge and Kettneraspis. 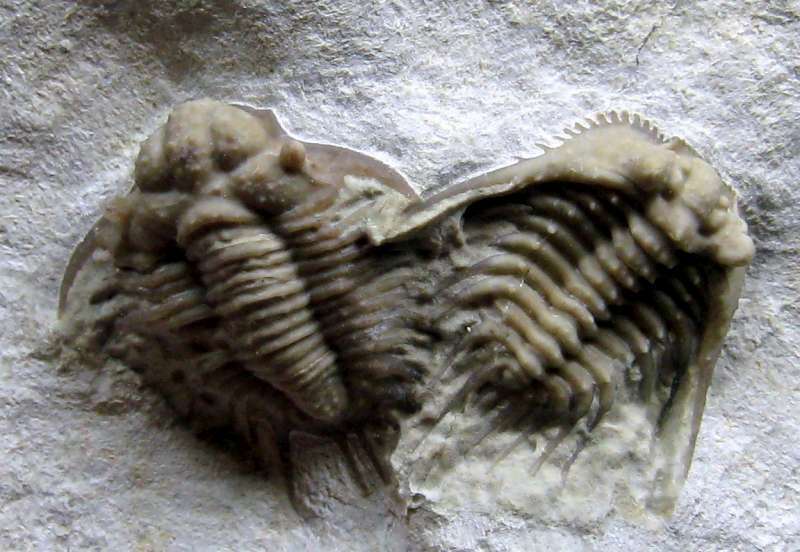 Ceratonurus species is one of the most beautiful trilobites to be found anywhere because of its structural complexity and delicacy. It is related to Miraspis species found in the Czech republic and similar congenerics in Morocco. The photograph below was provided courtesy of Sam Stubbs and Neal Immega. I recently learned that this specimen was prepared by Leon Theisen of Custom Paleo in Ardmore, Oklahoma. My apologies for not crediting him in the book for this very nice work. Below is a collection of photographs taken by Neal Immega of a single, very small specimen of a Ceratonurus species from the collection of John Moffitt. Notice the coin in the upper right image. 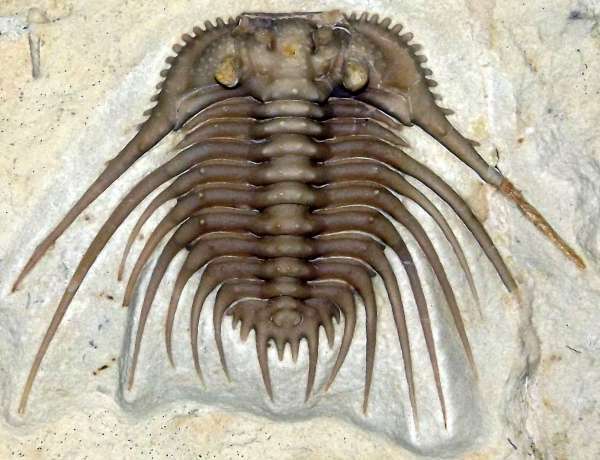 The anterior view of this same specimen is shown at the bottom of the Trilobites Through Time page of this website. Dicranurus hamatus elegantus from Oklahoma is similar in features to Dicranurus monstrosa from Morocco. The collage below shows my favorite image of the Oklahoma species at the top. Notice the cat-like appearance of the eye. This resulted from an accident of preservation, when at some point in the past the eye was stained by manganese- or iron-oxide rich moisture percolating through the entombing matrix. 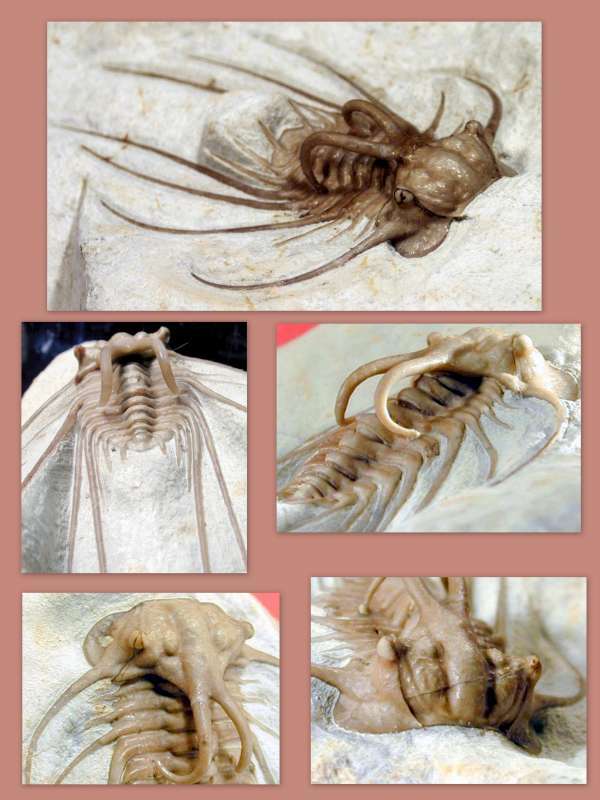 The remaining four photographs in the collage show various aspects of a second specimen. Photographs courtesy of Neal Immega and Sam Stubbs. Leon Theisen showed me the specimen below at the recent Tucson show. 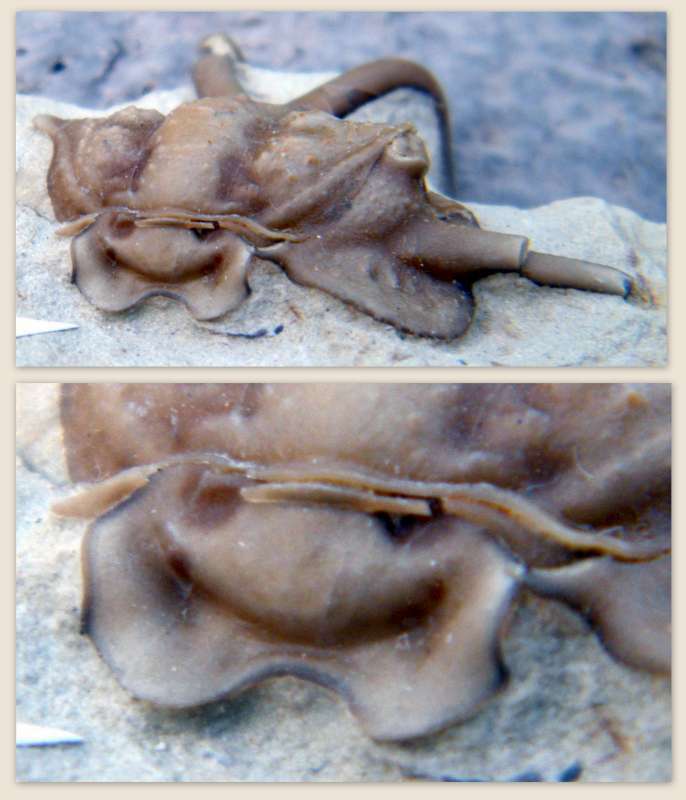 It is very unusual in that the hypostome is articulated, but may be deformed. In any event, it shows the general structure of a Dicranurus hypostome in place on the fossil. 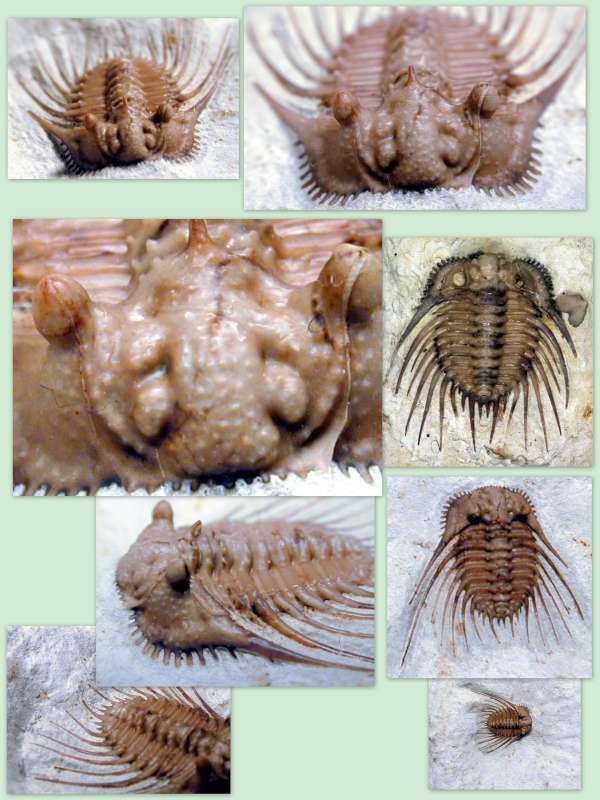 The collage below is for those who are new to these trilobites. It shows Dicranurus and Ceratonurus side by side in anterior and posterior orientations in order to provide the viewer with familiarity of their distinguishing features. 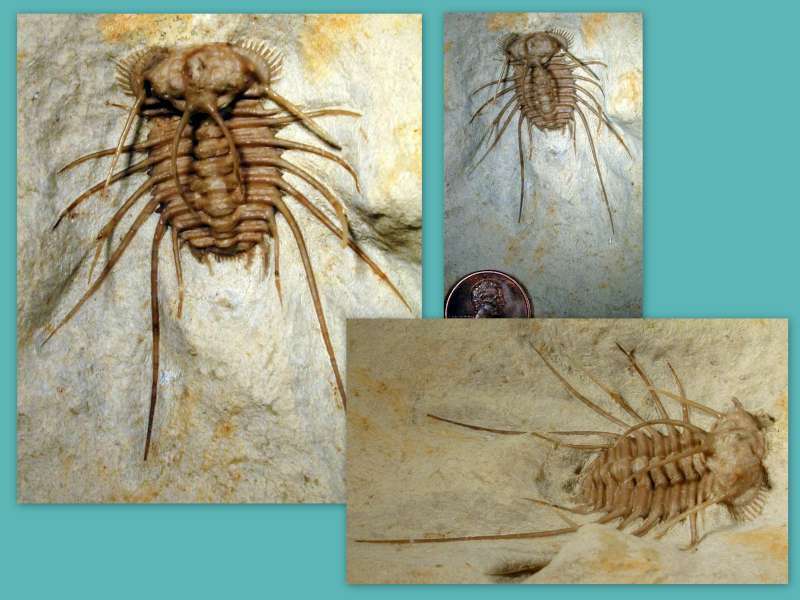 Beside differences in their eye structure and occipital spines, the margins of these trilobites are very different, but the viewer must look close. 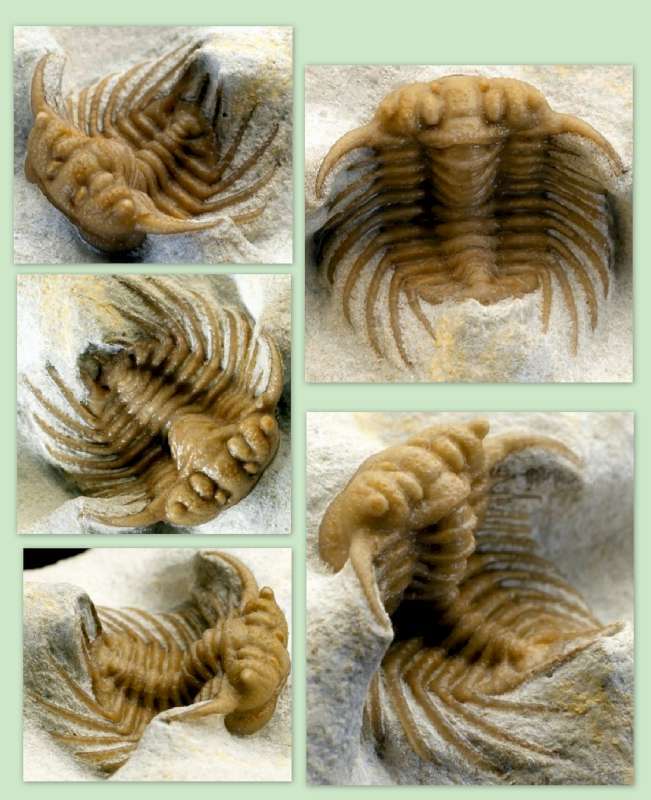 One specimen of this as yet un-named species of trilobite has been found at Black Cat Mountain in the Haragan formation. Various aspects of the specimen are shown below. Two specimens found in the Bois d'Arc about a mile south of Black Cat Mountain were described and named Laethoprusia graffhami, after Allen Graffham who found and donated them for publication in the Journal of Paleontology. See Adrain, Chatterton and Kloc, Systematics of the Koneprusiine Trilobites, with new taxa from the Silurian and Devonian of Laurentia, J. Paleont. 82(4) 2008, pp. 657-75.